Martin Heideggerâs Being and Time (1927) challenged earlier thinking about the basic structures of human being, our involvement in practical affairs, and our understanding of history, time, and being. 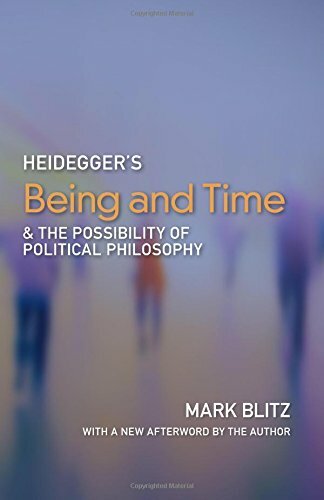 Blitz clarifies Heideggerâs discussions, offers alternative analyses of phenomena central to Heideggerâs argument, and examines the connection between Heideggerâs position in Being and Time and his support of Nazism. Although Blitz often questions and criticizes Heideggerâs views, he presents them with scrupulous care and clarity. Specialists and students in the areas of political theory, phenomenology, metaphysics, and moral philosophy will find Heideggerâs Being and Time & the Possibility of Political Philosophy an invaluable resource. Mark Blitz has been a professor of political philosophy at Claremont McKenna College for twenty years. He has also taught at the University of Pennsylvania, Harvard, Georgetown, and Indiana University. He serves as Director of the Salvatori Center for the Study of Individual Freedom at Claremont McKenna. He is author of Platoâs Political Philosophy, Duty Bound: Responsibility and American Public Life, and Conserving Liberty. About: Heidegger, Martin, -- 1889-1976. About: Martin Heidegger’s Being and Time (1927) challenged earlier thinking about the basic structures of human being, our involvement in practical affairs, and our understanding of history, time, and being.